Crohn's disease: A chronic inflammatory disease, primarily involving the small and large intestine, but which can affect other parts of the digestive system as well. It is named for Burrill Crohn, the American gastroenterologist who first described the disease in 1932. Crohn disease is usually diagnosed in persons in their teens or twenties, but can come to the fore at any point in life. It can be a chronic, recurrent condition or can cause minimal symptoms with or even without medical treatment. In mild forms, Crohn disease causes small scattered shallow crater- like areas (erosions) called aphthous ulcers in the inner surface of the bowel. In more serious cases, deeper and larger ulcers can develop, causing scarring and stiffness and possibly narrowing of the bowel, sometimes leading to obstruction. Deep ulcers can puncture holes in the bowel wall, leading to infection in the abdominal cavity (peritonitis) and in adjacent organs. Crohn disease comes in many forms. Involvement of the large intestine (colon) only is called Crohn colitis or granulomatous colitis, while involvement of the small intestine alone is called Crohn enteritis. 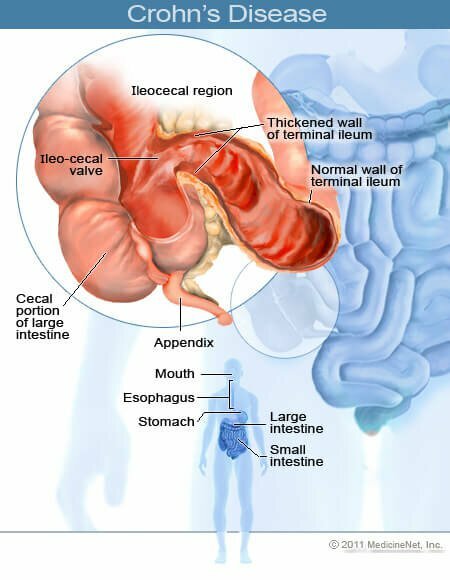 The most common part of the small intestine to be affected by Crohn disease is the last portion, called the ileum. Active disease in this area is termed Crohn ileitis. When both the small intestine and the large intestine are involved, the condition is called Crohn enterocolitis (or ileocolitis). Other descriptive terms may be used as well. Abdominal pain, diarrhea, vomiting, fever, and weight loss are common symptoms. Crohn disease can be associated with reddish tender skin nodules, and inflammation of the joints, spine, eyes, and liver. Diagnosis is commonly made by x-ray or colonoscopy. Treatment includes medications that are anti-inflammatories, immune suppressors or antibiotics. Surgery can be necessary in severe cases. Genetic factors contribute to the causation of Crohn disease. One of the genes has been shown to be on chromosome 14 in region 14q11-12.